I spent a surreal Memorial Day Weekend with three wonderful people at the Grand Canyon, and came away smitten by its austere beauty. 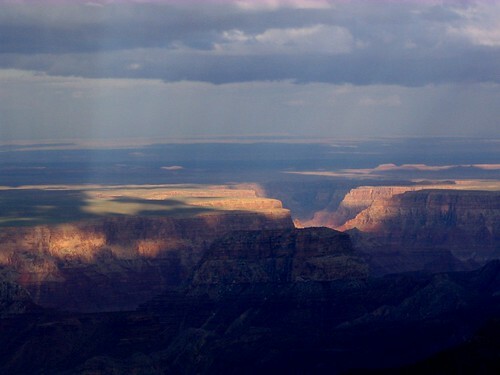 This picture is taken from the North Rim, where the sun and the clouds conspired to reveal liquid vistas on its ancient walls. It was like being in a geological time machine. Oh my. I’ve never been to the grand canyon. This photograph marks the first time I’ve ever realized how urgent it is to go there. It’s wonderful to step back and take in the “big picture” sometimes. Thanks for the photo and quote. Weeping Sore, welcome to Mirkwood. At the right time (just before sunset, and just after sunrise) on a cloudy day, scenes like the above are probably commonplace. It is such a wealth of options, that one is at a loss to pick which to photograph. I want to go back there sometime. Stefanie,BL: Thanks. It’s an awesome place. Just don’t believe _anyone_ who says that one can see the Canyon in a few hours. Even a week would be insufficient, but alas, no vacations can be that long (or can they?). What a shot! Many photos of the canyon portray its immensity and depth, but here it feels almost as if light and color are rising up out of the canyon instead of beaming down from the sky. Very special. For a very long time I kept this post bookmarked in my bloglines. I thought it was time to finally come out of lurkdom and say, yes, this is absolutely gorgeous!! I wish I were there now. Danielle: Thanks very much. The Canyon is so gorgeous that it is nearly impossible to take a bad picture. When you go there, do go early to catch the sunrise – that is another memorable spectacle.